Traditional style chair that has a natural Beech finish and a fanned back rest to complete the overall design. Manufactured to stock, these chairs have an optional upholstered seat pad that is available on request. Quaint and slightly unsusal design restaurant dining chair. 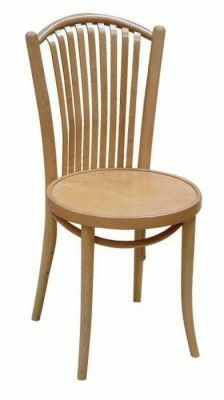 The chair includes a solid, round seat and unique back hosting wood slats. Available for a fast delivery.